The two title favourites round off the Premier League weekend at Anfield. Michael Cox and Alan Thompson preview the action. "The general pattern from the recent fixtures between these sides (and from matches in general when Klopp faces a possession-based team) is that Liverpool start well because of their energetic pressing, but City play their way into the contest gradually." Match Odds: Liverpool [2.6], Man City [2.9], The Draw [3.7]. Liverpool versus Manchester City always appeared likely to be this season's title rivalry, and seven games into the campaign, the two sides are joint-top of the Premier League: both played seven, won six, drawn one. This weekend's meeting feels like the most important Premier League game for quite a while, given the division's lack of a proper title race last season. Does Klopp have the upper hand over Guardiola? Last season, Jurgen Klopp's Liverpool seemed to have the measure of Pep Guardiola's Manchester City, defeating them 4-3 in the league and 5-1 on aggregate in the Champions League. We shouldn't forget City's 5-0 destruction of Liverpool in early September last year, but that came was affected by Sadio Mane's early red card, and Liverpool had dominated the opening stages. This time around, the ball is in Guardiola's court in terms of tactics. Klopp has a clearly-defined starting XI, is unlikely to alter his tactics significantly, and we can expect a familiar teamsheet from the home side. Alisson will be protected by Trent Alexander-Arnold, Joe Gomez, Virgil van Dijk and Andrew Robertson. Liverpool's defence has performed well this season, although space can open up in their right-back zone - Eden Hazard twice got in behind in that zone last week. Van Dijk appears to be fully fit despite recently struggling with a rib injury, while Robertson continues to overlap well. Naby Keita was forced off in the first half of Liverpool's defeat to Napoli on Wednesday and therefore it would be a surprise to see him start here. 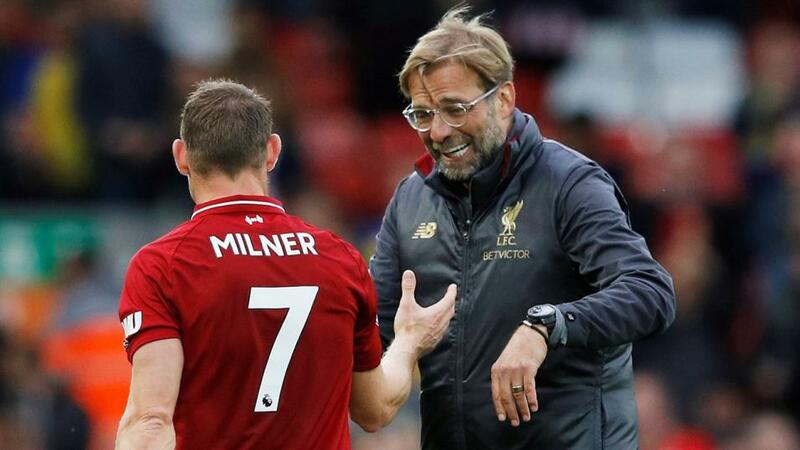 Expect Jordan Henderson to play the deep midfield role with James Milner and Gini Wijnaldum just ahead, with Klopp asking them to press intensely from the outset. The usual front three of Mane and Mohamed Salah either side of Roberto Firmino is perhaps the most cohesive in Europe, although Wednesday's performance at Napoli was probably their worst collective display. Salah still hasn't hit the heights of last season, although he has managed three goals. Guardiola's team selection is, as ever, much trickier to forecast. Napoli's success against Liverpool with a three-man defence might tempt him into using that system here, especially with Benjamin Mendy set to be available, and therefore providing Guardiola with a proper overlapping option down the left. Aymeric Laporte, Nicolas Otamendi and John Stones would probably form the back three, with Kyle Walker on the right. Guardiola will be wary of being outnumbered down the flanks in that system, however, especially with Liverpool's full-backs in such fine form, and therefore the four-man defence feels more logical. In midfield, Fernandinho will sit deep with David Silva probably joined by Bernardo Silva, although Ilkay Gundogan is an option and Kevin De Bruyne appears to have returned to training sooner than expected. Two wingers, or two strikers? The front three of Leroy Sane, Sergio Aguero and Raheem Sterling has worked very well in recent weeks, and while there's a possibility of Gabriel Jesus returning if Guardiola uses a 3-5-2, it would be odd for him to disturb the cohesion in that zone. Even if he does use that system, Sterling playing as a second striker might be a better bet. The general pattern from the recent fixtures between these sides (and from matches in general when Klopp faces a possession-based team) is that Liverpool start well because of their energetic pressing, but City play their way into the contest gradually. For that reason, I rather fancy Liverpool to win the first half, but City to dominate in the closing stages. Venturing into the Half-Time / Full-Time market therefore feels logical, and while you don't see this level of turnaround very often, I'm going to be bold and back Liverpool/Man City at [32.0]. Both sides come into this one on 19 points and identical unbeaten records (W6 D1), both sides are also returning from away Champions League action midweek. City managed to come from behind and find a late winner at Hoffenheim to record a 2-1 victory, while Liverpool were hit by a late winner in Napoli losing the game 1-0. Goals seem to be on the agenda when these two meet and while both teams to score looks a good option, I don’t see much value in the price at around [1.56] despite thinking it may well occur, I think I would prefer to look elsewhere for a bet. There have been 23 goals shared between the sides in their last six meetings at Anfield (in the league) that’s an average of 3.8 goals per game. I will be splitting my stake, backing Over 3.5 goals at anything around [2.8] before kickoff and then if Over 2.5 goals reaches [2.0] in running, I will be placing the other half of my stake on that.